The weather's turned colder this week and most of the autumn leaves are down, ready to add their mulch to the garden over the winter months. 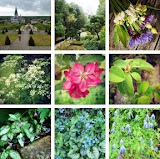 I took a few snaps recently to show you as my final celebration of this season's gifts. This post serves as a final record of the Berberis thunbergii 'Gold Ring' at the bottom of the garden. It comes into its own at this time of the year with the most incredible fireglow to warm this gardener's heart. However, who in their right mind adds a thorny shrub to one of their main garden beds? Well, I added three of them and it's high time I corrected that mistake. I'll ponder a replacement shrub over the winter; something with similar fireworks is my intention. Ideas anyone? 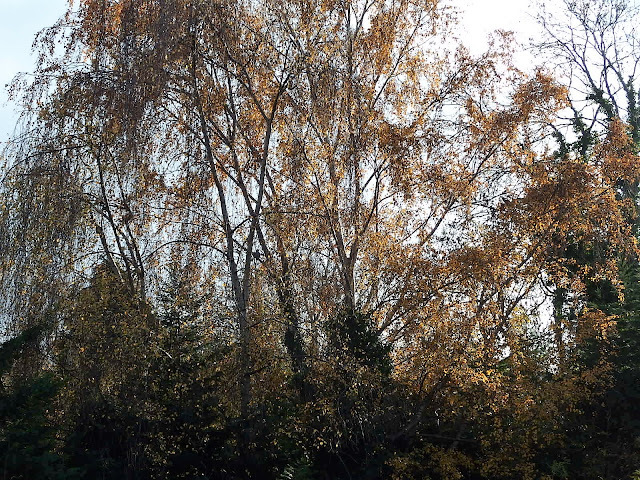 Elsewhere the wispy silver birches I can see from my bedroom window are being their usual seasonal barometer. I spend more time than I should simply watching them and I love seeing how they change with each season and the sky behind them. 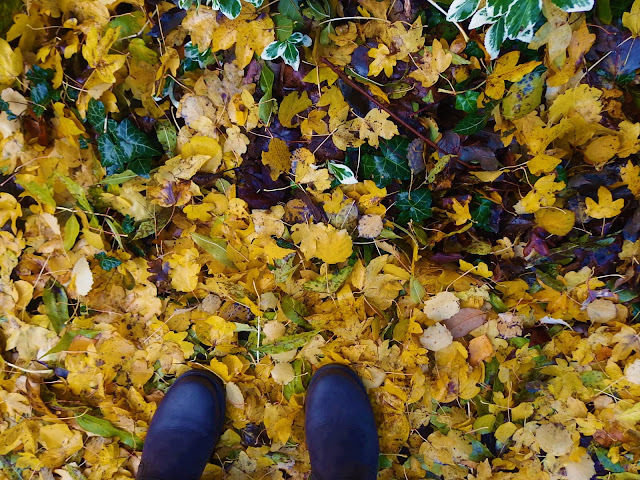 At the front of the house, it's looked like the streets are paved with gold for weeks this year. The volunteers at Westonbirt told me it's been a good season for yellow when I was there recently. This report gives a potential explanation of why we see more yellow leaves in Europe compared to North America. 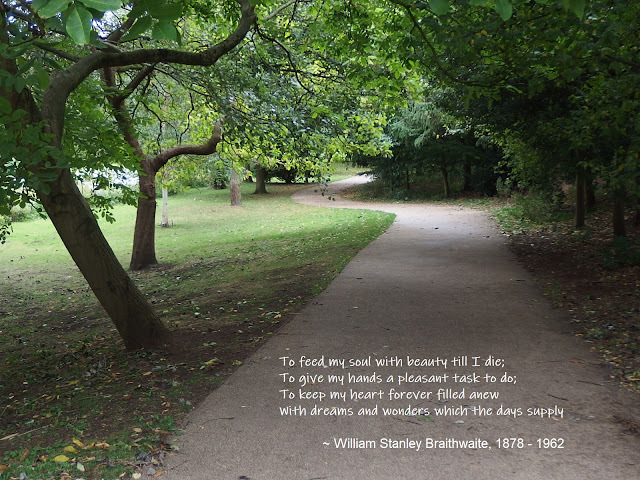 I remain to be totally convinced of this (especially as we get these fiery reds in the tall Fraxinus trees at the top of our hill), so I need to do more delving. Westonbirt was looking spectacular as usual when I visited, with all kinds of autumnal colour on view. Many of the thousands of trees they have there are non-native, so I guess they still have the anthocyanin producing adaptation hypothesised in the research (which produces the red leaf colour) I linked to in the previous paragraph. The deeper delving I need to do is to see whether any of our 33 native trees produce red leaves. 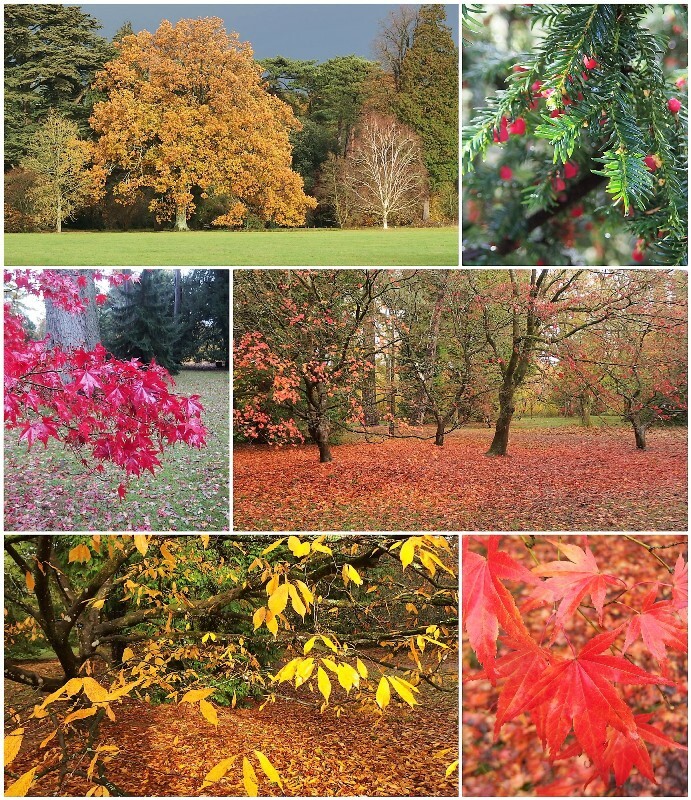 I hope to be joining the volunteer team at Westonbirt in the new year, so watch this space for more visits. How's autumn been in your neck of the woods? Same here Flighty, though that Berberis is hanging on! Autumn has been wonderful here in Devon. I went to Canada to see my nephew and the autumn tints. When I got back , the Acers in my garden and the beech trees in the next village were just as good as any we saw across the Atlantic! That's interesting - I've often wondered if we could rival the north American display, especially when I'm at Westonbirt. However, I did find Autumnwatch's trip stateside most tempting! Volunteering at Westonbirt sounds fun. Tell us more, as it happens. I guess you know the red firework from firebush: Euonymus alatus 'Compacta' - it is magnificent.